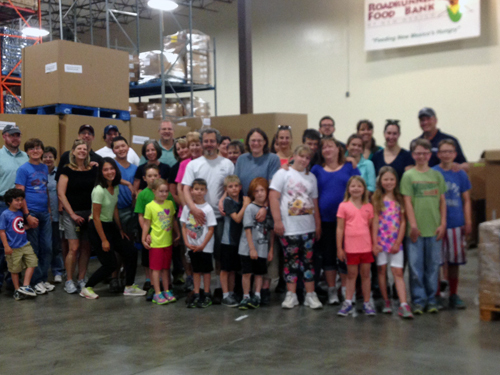 More than 30 Modrall Sperling employees and family members donated their time on Saturday, June 12th at the Roadrunner Food Bank. Team Modrall sorted and boxed 15,840 pounds of canned food, or enough food to provide 5,290 meals to hungry families in New Mexico. All agreed it was a worthwhile way to spend Saturday morning with colleagues, family and friends – making a positive impact on hunger in New Mexico. The Roadrunner Food Bank of New Mexico has been serving New Mexico’s hungry since 1980 and is the largest food bank in the state. Each year, more than 28 million pounds of food is distributed to a network of hundreds of agencies and regional food banks throughout the state. These agencies provide food directly to the hungry though food pantries, shelters, group homes, soup kitchens, low-income senior housing sites, and regional food banks. Through that network more than 70,000 people receive meals each week, the equivalent of feeding a city the size of Santa Fe.